This study measures the willingness of male and female farmers to pay for climate-smart technology in rice. Rice is the most important crop in India in terms of area, production, and consumption. It is also the biggest source of greenhouse gas emissions among all crops. Direct-seeded rice (DSR) with drum seeder, a climate-smart technology, requires less labor and water and is more climate friendly than transplanted rice; yet, its adoption is slow in India. The authors of this study carried out a discrete choice experiment with 666 farmers from the Palghar and Thane districts of Maharashtra to measure their willingness to pay for drum seeders—a key piece of equipment for adopting DSR. Both male and female farmers were surveyed to capture the heterogeneity in their valuation of the key attributes of drum seeders. Although both male and female farmers prefer cheaper drum seeders, the marginal valuation of different attributes of the drum seeder varies by the farmers’ gender. The authors also used the Women Empowerment in Agriculture Index (WEAI), developed by the International Food Policy Research Institute (IFPRI), to collect self-reported data on the role and say of women in agriculture. The respective gender roles in the family and on the farm seem to explain some of this difference. Men have a greater say over how the family spends the cash. Accordingly, men tend to have a higher willingness to pay for attributes that increase income (increase in yield) or reduce cash costs (reduction in the seed rate). Women contribute a large share of the labor for transplanting rice, much of which is unpaid work on family farms. Not surprisingly, therefore, women seem to value labor saving significantly more than their male counterparts. Further, the WEAI data show that although men in the family have more say, women do have an influence on decisions regarding crop production and the adoption of new technologies, to an extent. Therefore, to enhance the adoption of drum seeders, the product designers and extension workers should also target women. Khan MT, Kishore A, Joshi PK. 2016. 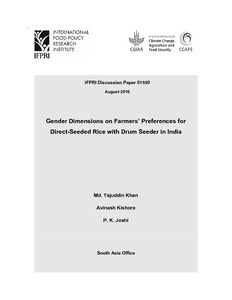 Gender Dimensions on Farmers’ Preferences for Direct-Seeded Rice with Drum Seeder in India. New Dehli, India: The International Food Policy Research Institute (IFPRI).